If you had six Booster Gold autographs and Booster gave you seven more, how many autographs do you have? 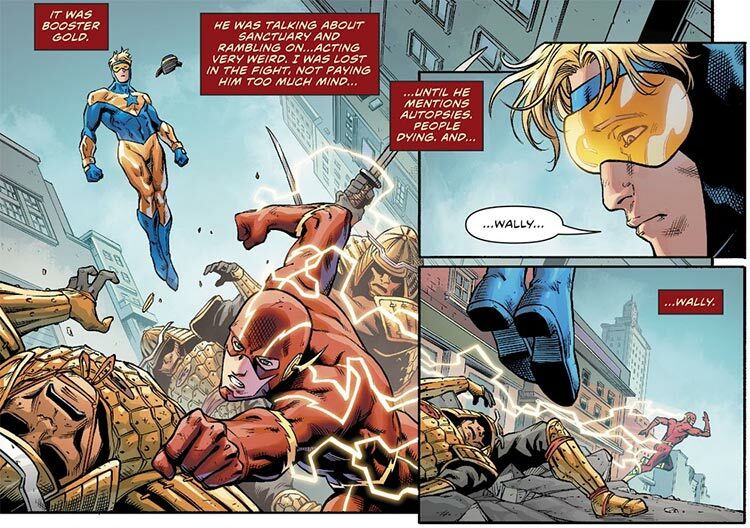 If Booster Gold had six costumes and Doomsday destroyed six of them, how many costumes remain? I picked up Swamp Thing Winter Special and found something interesting for Booster boosters. This book has a 2nd story in it that was not finished by the late great Len Wein. 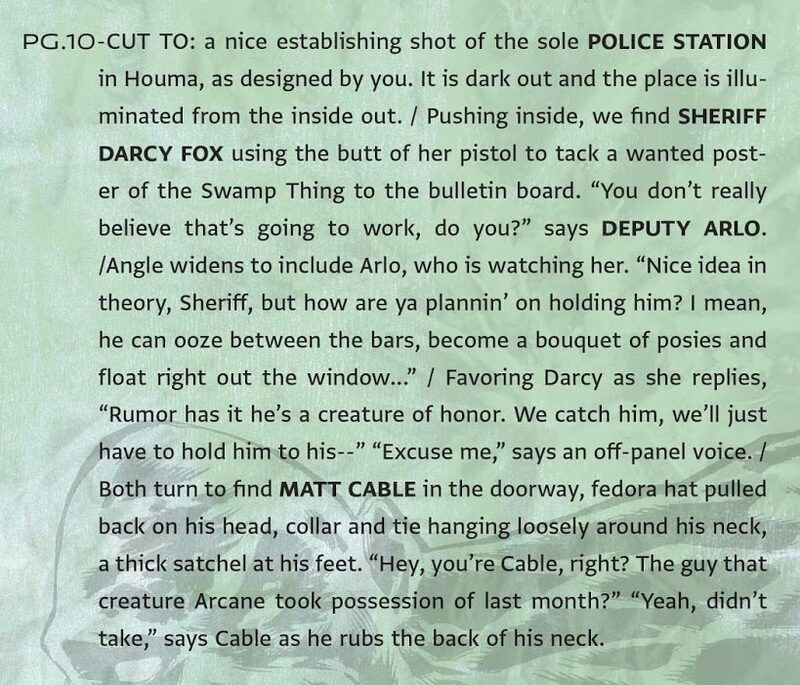 In this story there is a scene of the new Sheriff of Houma, LA putting up a wanted sign of Swampy. Next to that sign is another wanted poster of a Michael Carter. What kind of shenanigans could Booster have been up to...? Hmm. What kind of backwater police department is this, anyway? Those wanted posters seem awfully amateurish. If I were Booster's lawyer, I'd argue this as a case of mistaken identity. I mean, "Michael Carter" has to be a common name, right? And everyone knows Booster's hair is blond, not brown. As Kevin states, the unfinished story's script is included in the issue, and it makes no reference to the "Michael Carter" wanted poster. Was this added by artist Norm Breyfogle? Breyfogle has never drawn Booster Gold before. Does this count? What do you think, boosters? Well, of course he doesn't look like Booster. Breyfogle has never drawn him before. That proves it's him. If it did look like Booster, we should assume it's not. P.S. 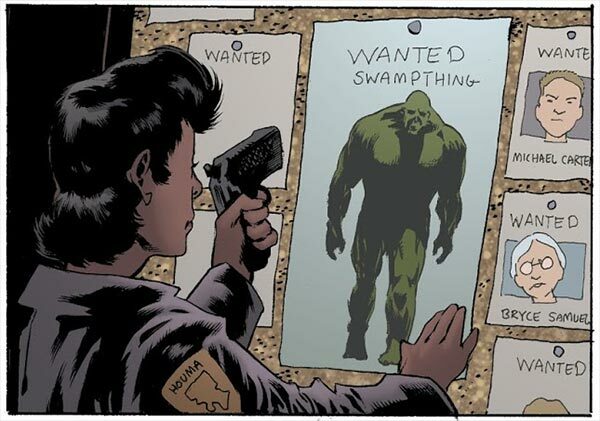 How is Swamp Thing Winter Special? I enjoyed it. The primary story kept me thinking about its meaning. I liked that. I also liked the pin up tribute to Wein at the end. Ooh, neat. I might check it out. For the record, Houma has a chief of police, not a sheriff. And I don't know what that is on that patch, but HPD's patch is an Indian in full Lakota headdress. As a resident, I assure you this is factual. That just goes to show that the current DC Earth is a very different place from Earth Prime. :) Some politicians in DC's Houma decided that Sheriff sounds cooler than Chief of Police, and some other politicians decided that a man with a Lakota headdress used as a logo is arguably racist, unrepresentative of Louisiana, or both. Butterfly effect and vibrational frequencies and whatnot. I am pretty sure that the Indian head is not intended to be racist, but rather to honor the Houmas Indian tribe the town is named for. Since the local Houma Nation has no problem with it, I don't see why anyone else would. I just find it interesting that the writers apparently just threw a dart at a spot on a map of Louisiana and write whatever without bothering to research the area. I know that Houma has been the setting for SW since the series started, but, hey, a little effort to the extent of looking at a Wikipedia article would be nice, butterfly effects and suchlike notwithstanding. Oh, I agree. What I meant was, you can use parallel universes to explain any mistake or lack of research. I understand, but I'm not a big fan of Handwaves like that (i.e., the away team can't be beamed up because of interference in the ionosphere or some crap, when we all know it's because Riker wants some alien poonanny). If you had two Booster Gold autographs and Booster gave you five more, how many autographs do you have? If Booster Gold travleled forward in time four years and then traveled back two years, how many years forward is he now?